Reel Talk Online: First Look: "Jack and Jill"
First Look: "Jack and Jill"
The following trailer is quite possibly one of the saddest trailers you will ever see this year. It confirms two things: Katie Holmes shouldn't be in any more movies, and....neither should Adam Sandler (at least until he gets his act together). 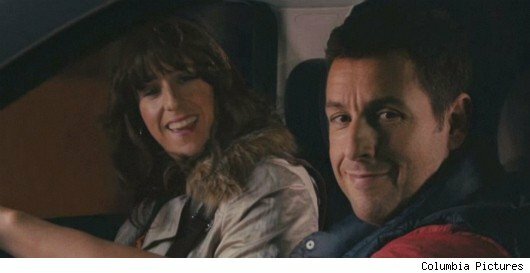 With a very inconsistent career, Sandler has reached the inevitable poin in many comedian's careers where it's time to don drag. And it ain't pretty, ladies and gents. I present to you the newest debacle, er, movie from the Sandler collection, Jack and Jill. The comedian plays a father and husband to Holmes and must find a way to live under the same roof as his annoying sister (also played by Sandler). It's just a mess. It should do fine at the box office. Coming at ya November 11 (and co-starring Al Pacino? ), here is Jack and Jill. I just don't know what to say about Sandler anymore. What a career digression. My only hope is this film makes nothing at the box office like Just Go With It. Then maybe he will straighten up. I thought he was starting to care a few years ago. Guess not. A couple of Razzies on the way, don't you think? It would be an understatement to say I'd be shocked if it turned out to be good.